The overwhelmingly white baby boomers will be supported in their retirement by an increasingly Latino workforce. The economic output of the roughly 55 million Latinos in the United States would form the seventh-largest economy in the world, a new report shows, with a GDP of $2.1 trillion in 2015 — just behind France, but ahead of India. If they were a US state, they'd have the country's second-largest economy, behind only California. The report, produced by the Latino Donor Collaborative, is part of an effort to promote what is says is "a factual view of the importance of Latinos to our economy." Far from being "a burden to U.S. society," it says, Latinos are a young, growing, and productive part of the economy. As the US population ages, the workforce is becoming more and more Latino. The median age of Latinos is 28, compared to 40 for the non-Latino population. 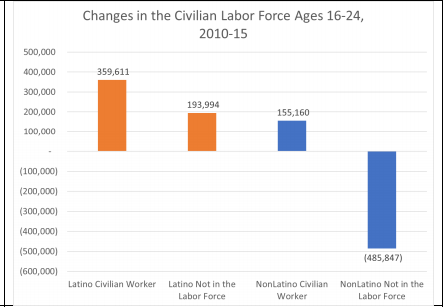 From 2010 to 2015, 360,000 young Latinos joined the labor force, compared to 155,000 young non-Latinos. The difference is even more striking for adults beyond college age. 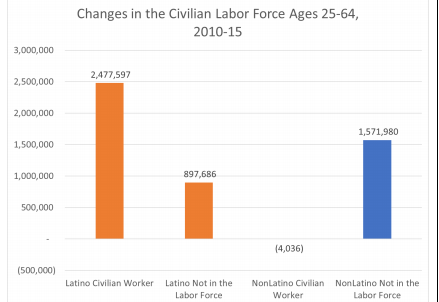 In that same five-year period, 2.5 million Latinos aged 25-64 joined the labor force, while the number of non-Latinos of the same age in the workforce actually shrank. "Latinos are the future of the U.S. workforce," the report says. All those people in their prime working years are helping the Latino economy grow considerably faster than the rest of the country. Between 2010 and 2015 it grew 2.9% per year, while the non-Latino economy grew at 2.1%, the report said. Going forward, this means that the overwhelmingly white baby boomers will be supported in their retirement by a labor force that is increasingly Latino. The report's authors, Werner Schink and David E. Hayes-Bautista, did similar research in California predicting such a population changeover. California is 39% Latino today, and the authors say a similarly important change is happening in the national economy. "While in the past we said here are the demographic numbers, we can say now how important that changeover is," Hayes-Bautista told BuzzFeed News. "We’ve reframed from [demographics] to GDP."